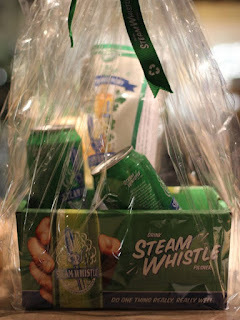 Well, it would seem, not to be out done by themselves, the folks at Steam Whistle dropped off another package for us at Beer Geeks. Some T-shirts, openers, whistles and other swag were not out done by the cans of beer and a 1 litre glass boot! Looking forward to sharing the swag and enjoying the beer!